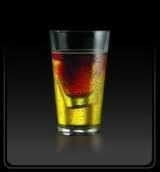 mix 1/2 & 1/2 in a shot glass peach schnapps and crown royal. Then drop in a glass of red bull. Like a boilermaker.